The very first entry in my grandmother’s battered, handwritten recipe book is for a ‘Good Xmas Cake’. Grammo probably began her recipe collection around the time of her marriage in 1919; the weights and measures are recorded in Imperial units (pounds and ounces, pints and gills) and the somewhat vague ‘breakfast cup’. Make and bake the same as pound cake. As luck would have it, the very next recipe in Grammo’s well-thumbed exercise book is for a ‘Prize Pound Cake’. Here are the complete instructions that follow the ingredient list: ‘bake 2 hours in a moderate oven’. Combine that with the Christmas cake’s method and you have a total of fifteen words to guide your baking endeavours. I’ve just checked one of my daughter’s (many) cookery books for a contemporary Christmas cake recipe. The particular book I’ve selected (typical of today’s culinary publications) is bound in a hard cover, features a raft of ornamental typefaces and illustrations, and is replete with colour photography. The Christmas cake recipe, which makes a single ‘13cm (5in) round cake’, comprises an introductory history, 30 ingredients, ‘bakery notes’ and a method. The latter is a 500-word miasma of pouring, stirring, mixing, adding, incorporating and combining, not to mention the baking, inverting, cooling and covering. Yesterday’s cooks learnt all they needed to know about ‘method’ at their mother’s knee. Today’s depend on the wisdom of celebrity chefs. My grandmother’s cake would have fed a substantial Christmas crowd. It used 2 ½ lbs (1.1 kgs) of flour and 2 lbs (0.9 kg) of sugar. The recipe in my daughter’s book—with three times the number of ingredients—requires just 2 oz (55 gms) each of flour and sugar. It seems the complexity of recipes has swollen in inverse proportion to the number of guests being fed. About a third of the way through Grammo’s old exercise book, after the recipes for feather cake and angel’s food and war loaf and gem scones, there is a second Christmas cake recipe. This one is attributed to Mrs M (quite possibly my mother’s mother-in-law, my paternal grandmother). The entry was probably recorded in the early 1940s but, further than that, its provenance is unknown to me. The recipe lists the same basic ingredients as the ‘Good Xmas Cake’, but includes substantially more fruit. It could be that Mrs M’s recipe is a post-depression (and even a post- World War II) one and that there is more money available for additional fruit at this time. If ‘Mrs M’ is my paternal grandmother, she certainly didn’t come from a wealthy household—it’s unlikely there would have been any frittering away of hard-earned cash on expensive ingredients. It might also be that the cost of dried fruit has dropped considerably. In 1930, for instance, currants cost 8-9 pence per pound; in 1942, the cost had halved following the fixing of prices by the Fruit Industry Sugar Concession Committee. I suspect the days of handwritten recipe books are now gone. My mother followed her mother’s example of recording her own recipes, but with a ‘modern’ twist. Instead of writing recipes in an exercise book, mum typed hers on 3” x 5”, colour-coded (for mains, desserts, cakes/slices, jams, etc) cards. She stored them alphabetically in a hinged, metal filing tin, and used a system of ticks (1, 2 or 3) to indicate a recipe’s success. My mother’s recipe card file (right) and my smaller version (left). Mum painstakingly reproduced many of these recipe cards (filed in a slightly smaller tin) as pre-wedding gift to me. It’s not a tradition I intend to continue. This week, when my affianced son required copies of family Christmas recipes—yo yos, cheese straws, hedgehog—I simply plucked the relevant card from the metal tin, took a photo on my mobile phone, and pressed ‘send’. Following the introduction of decimal currency in 1966, it took about a decade for Australia to convert to a full metric system. The Metric Conversion Board oversaw the process between 1970 and 1981. Further background here. A quick search of digitised newspapers on Trove provides some examples of the cost of currants. For example: 1930: ‘Retail price of currants’, Murray Pioneer and Australian River Record, 19 September 1930, p. 3.; 1942: ‘Fruit price problem’, The Mercury (Hobart), 10 January 1942, p. 4. My grandfather returned from the First World War in 1919. He worked ferociously for 18 years to build a family, a career, a community, a nation. And then he died. I’m reaching an age where family history beckons me. I have time to ask questions now. Who were the people who came before me, what shaped their lives, how have their lives shaped mine? Today, it’s easy to answer basic questions about living people. Our lives are documented and captured ad nauseum, often unwittingly and unknowingly. My brother-in-law, for example, doesn’t own any electronic devices and he’s never used a computer. He might be surprised at the extent of his online presence—news articles, photographs, community records—none of it intentionally generated by him. Even without Twitter or Instagram or Facebook accounts, he’s easy to ‘find’. Compare that with my grandfather’s life a century ago. No internet, no mobile phones, even cameras are a novelty. How do I come to know this man? His name is Hiram. I have an assortment of physical items that once belonged to my grandfather. Among them, a certificate verifying his membership of the Juvenile Order of Rechabites and a card outlining the rules for his local Harriers club. There’s the receipt from the hotel where he and my grandmother spent their first night as a married couple, and a business card for the real estate agency he set up with his brother-in-law. There are pictures of the town carnival he helped establish and his handwritten notes for speeches delivered at political rallies. 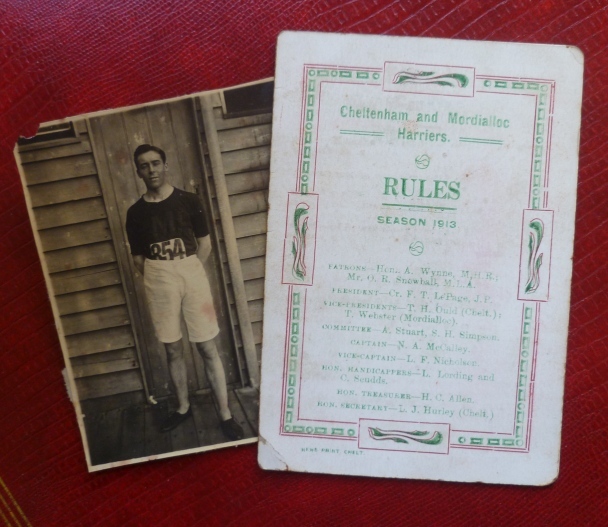 Most numerous of all is the memorabilia from his war service: colour patches, medallions, poems, photographs, postcards, international currency, leave passes. What strikes me is how intentional this collection is. It has already been carefully curated (and censored?) to provide a version of his life; each item deliberately retained by my grandfather, then by his wife and, later, by their daughter—my mother. It’s private and personal. Through the objects in the curated collection, I can discover what my grandfather considered important. I can see how he chose to be seen—a teetotaller, an amateur athlete, a husband, a businessman, a community leader, a political activist, a serviceman. But there are other sources of information, too. Does the material they hold align with the image he preserved? There is the public record—family notices in newspapers, published obituaries, cemetery listings and the like, and there are official sources—certificates from Births, Deaths and Marriages; military service records; repatriation files. In both the public and official sources, Hiram loses agency. Another person or organisation takes charge of his life narrative, and their intentions differ from his. It’s like changing the lens in a camera—the subject in the frame remains the same, but the perspective shifts. Let me give you an example. There is a whispered story in my family, gleaned from relatives long dead. The story goes that my grandfather died from the effects of mustard gas poisoning, sustained during the war. My understanding is that the longer-term health effects of mustard gas inhalation are respiratory disease and, potentially, lung cancer. Hiram’s death certificate—an official source—records his cause of death as kidney cirrhosis, hyperpiesia (persistent high blood pressure) and heart failure. His lungs were fine. So what is the story behind the bare facts? Is the family’s mustard gas tale a furphy and, if it is, why was it told? Change the lens again and yet another perspective is revealed. Hiram’s Repatriation Commission files detail his medical condition over a period of 20 years. His reported symptoms include headaches, insomnia, ‘nerve trouble’ and a ‘feeling of depression’. The symptoms are attributed to the ‘strain of active service’. (His treatment comprised tonics, sedatives and liniments.) Am I now looking at a man diminished by shell shock, or what, today, I would call Post-Traumatic Stress Disorder? No hint of this possibility exists in the brief obituary published in the Melbourne Age. Lauded in this source for his community engagement, Hiram is quintessentially a ‘well known member of the 59th Battalion’. The privately collated collection, the whispered family folklore, the public record, and the official sources offer variant versions of one life. Cover image courtesy of Black Inc. 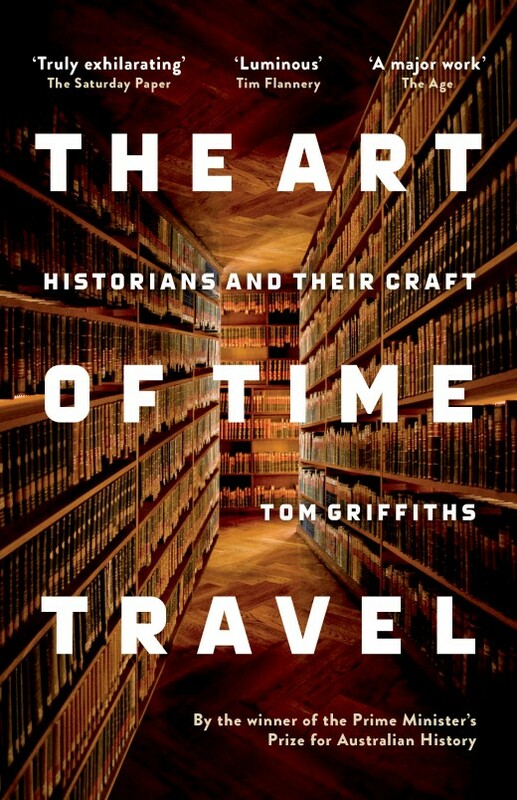 In his book The Art of Time Travel: Historians and Their Craft, Tom Griffiths writes: ‘History … is a powerful disciplinary tool in the search for truth. But its greatest virtue is uncompromising complexity. As we study the past it changes before our eyes, affected by our gaze and eluding definitive capture … The art of time travel is to maintain a critical poise and grace in this dizzy space. There is a further hazard: we never return to exactly the same present from which we left, for time cycles on remorselessly even when we seek to defy it. And in the course of our quest we find that we, too, have changed’ (p. 321). The question I posed initially about my grandfather was: ‘How do I come to know this man?’ One answer is, ‘I can’t’. I can know about him, using the historian’s tools. I can glean something of what he thought significant in his own life, and I can see how he is rendered by others. The essential Hiram may be undiscoverable. But perhaps there is another question worth asking. As I seek to rediscover an ancestral life, how might that quest change me? There may be hazards, as Griffiths warns, in time travel. There could also be gifts.